Thank you very much wallisface! In matchups like Spirits, I usually board out the Trapmaker's Snare and bring in more removal. Like you said, the Field of Ruin are key so 4 are a must. Although, with so many decks that fetch, most decks turn the traps on for me. I’ve also really liked how many of the cards allow me to see my opponents hands. This way I know when I can commit to a big Mill turn safely. everstar123, RainbowKraken, olivertwist I covered up those card. 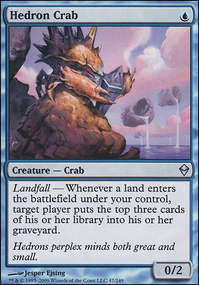 Flaggofchaos Tailoring your deck for your metagame is what you should do. Bravo! frogkill45 Thanks for the info! SurpriZe It happens when your hand force you to play it on turn 1. It is a rare occurrence, however. aquacode I'm sorry I couldn't read your post in time! pimplez Thanks! I've made an update. zga Thanks! I would totally cut some Breaking s in order to make room for Fatal Push . I recommend to leave the rest as it is. Kingpin4life Giving up on Fatal Push in the main surely gives you worse games-1 in some match-ups, but it's totally worth it in most metagames. Dasein07 I wouldn't make those changes. I argued about the choices a lot in the primer. Give it a read if you need. 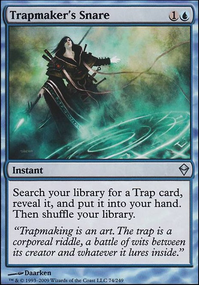 zga That card is flawed like Snapcaster Mage is, and about the ability of casting Archive Trap there can be an argument about Trapmaker's Snare being a better card overall, especially when playing Field of Ruin . jonmaior- Umm.. where do you see Trapmaker's Snare ? I'm curious, why do you run x2 Trapmaker's Snare instead of just x4 Archive Trap ? I've been playing mill for about 3 years at my lgs. Plebty of top tier decks there we usually go 5 rnds. Ive been having alot of success with Trapmaker's Snare going to get my archive traps and ravenous traps for 2 mana is useful. Also it allows you to have a card like snapcaster where u can flash that spell back and still cast it again since its so much mana to cast archive trap for flashback. I've had 2x Snapcaster Mage here before. It did what it was supposed to, it just didn't do it well enough to justify another $80 increase to the price of the overall deck. My perspective is: yes, Snappy opens up gy resources, but also essentially doubles that spell's cost. It just isn't right for this build, IMO. There's simply no room for it. As far as Trapmaker's Snare. I have a deck (unlisted), that's built around that silly little combo. For this particular strategy. 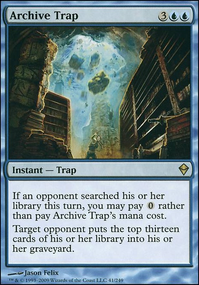 To be honest, both Snare and Archive Trap seem to only take up real estate in-hand, while I either wait for them to search thier library, or uh.. hope their stupid enough to search their library after a Ghost Quarter, or Path to Exile, I don't like hope.. While I play a heavy psychological game at the table, I don't like to leave much to chance when it comes to the cards I'm playing. While Field of Ruin guarantees a search, it also makes me pay to do it, and then another to then search with Snare simply not resource efficient, in my experience. Great minds think alike! I appreciate the feedback, as always! Again, it's all meta specific; What works for me, may not for you! I run a similar Esper build, but I also throw in a few Noxious Revival. 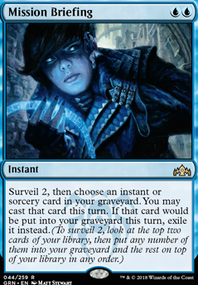 Along with a draw card like Visions of Beyond you can Archive Trap turn one, cast Noxious Revival then Visions of Beyond to Archive Trap them again. It's just a silly good combo. Also consider Trapmaker's Snare as a turn two way to get an Archive Trap and cast it on the same turn.